The information presented on this page was originally released on May 19, 2003. It may not be outdated, but please search our site for more current information. If you plan to quote or reference this information in a publication, please check with the Extension specialist or author before proceeding. Who knows why I remember the Brylcream slogan, "A little dab'll do ya," or what the connection is in my mind to coleus? I'm thinking that a little dab of coleus may do, but the bigger the dab, the better. Many of you have looked at coleus with that Brylcream attitude, thinking that one little coleus here or there should do just fine. This prevalent thinking means we are under-utilizing a terrific bedding plant -- one that will look showy for months. For its true potential, mass plant at least seven in a large, informal drift. Since the early 1990s the coleus has gone from an obscure plant to one of unprecedented popularity. The colors are richer, more highly variegated, and many are now able to withstand full sun throughout the growing season. New, vegetatively produced varieties of coleus are resistant to blooming, thereby providing non-stop, vibrant, colorful foliage from spring until frost. Coleus prefers fertile, organic-rich, well-drained soil. Amend tight, heavy soil with 3 to 4 inches of organic matter. Till to a depth of 6 to 8 inches. It pays to know your varieties because while some can thrive in full sun, others will need mostly shade. Some are flower-producing, but it is actually the foliage that is desired. Coleuses produced by cuttings are superior. Space plants as recommended per variety purchased. Keep the coleus watered and mulched during the growing season. Feed with a light application of a slow-release, 12-6-6 fertilizer one month after transplanting and again in mid-summer. Too much nitrogen has been known to cause excessive greening. Pinch in mid- and late-summer to keep the plant bushy. The coleus is a tropical plant and can certainly give a carnival-like atmosphere to the garden. Grow in the shade garden with ferns, gingers and hostas. Use in the tropical garden in front of bananas and elephant ears. Use bright red selections with bush allamanda. Try burgundy or maroon varieties with bright gold or yellow flowers, such as New Gold lantana and Indian Summer rudbeckia, or with the glistening white Shasta daisy. Most sun coleus varieties work in shade as well. Four sun coleuses in variations of red from maroon to burgundy have been recognized as award winners in the South. Plum Parfait and Burgundy Sun were chosen as Texas Super Stars. New Orleans Red is a Louisiana Select winner, and Mississippi Summer was chosen as a Mississippi Medallion winner. The Solar series, with several variegated selections, is truly outstanding. Solar Sunrise and Solar Eclipse are the most popular. Unique varieties like Kiwi Fern, Tilt a Whirl, Ducks Foot Red and Swiss Sunshine have now become more than novelty selections. 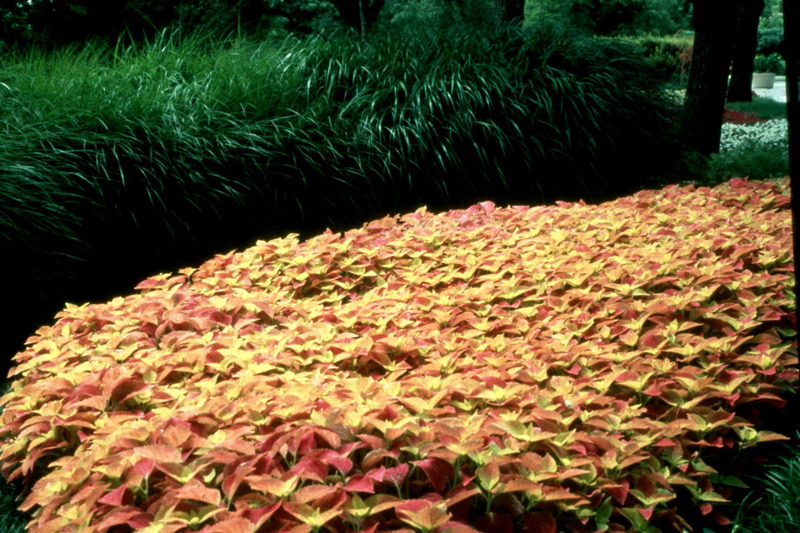 Relating the Brylcream jingle to coleus may sound wacky, but it's not nearly as crazy as planting only a "dab" of it in your landscape this summer.